Capsaicin is commonly applied to horses in the form of an analgesic and anti-inflammatory heat rub cream to ease the symptoms of lameness, laminitis and arthritis. Capsaicin and the related dihydrocapsaicin are alkaloids are banned in competition by the International Equestrian Federation (FEI). 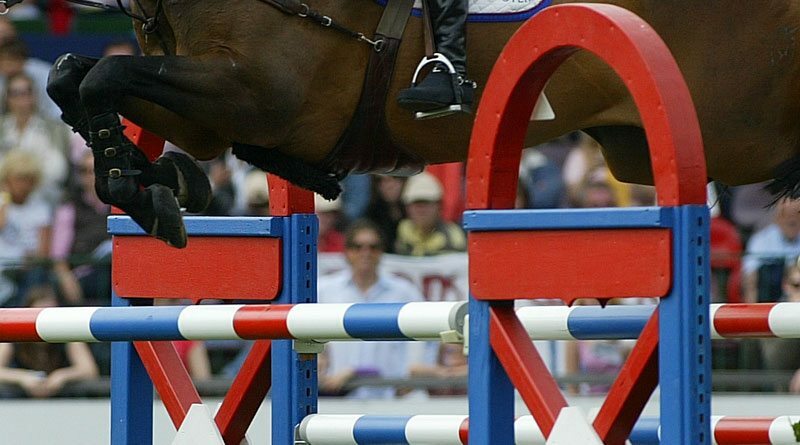 Indeed, four of the 15 samples collected from showjumping horses at the Beijing Olympics in 2008 during anti-doping tests revealed the presence of capsaicin, causing those horses to be disqualified. Gels containing capsaicin, derived from the Capsicum family, are available in many countries in equestrian shops. These preparations are often used by sports and pleasure horses owners for mild lameness, or swelling as a first-line treatment before a veterinary consultation. Such use is intended for curative purposes, including limiting pain and lameness, rather than doping. The most commonly described regimen for the use of gel containing capsaicin involves five days of administration together with polar bandages. Agnieszka Żak and her colleagues set out to determine the detection time of capsaicin in both plasma and serum after long-term use of a gel recommended for commercial use and applied as intended. Nine healthy and mature horses had 0.1% capsaicin topically applied in the form of a commercial analgesic gel (15 grams of the gel per limb) to the front limbs every 24 hours for five days with a polar-fleece bandage. Venous blood was collected before gel application and in the 12th, 18th, 24th, 36th, 42nd, 48th, 60th, 84th, 108th, 132nd, 156th hour after the gel application. It was centrifuged so that plasma and serum samples could be tested individually. Tests were performed using ultra-high performance liquid chromatography coupled with a triple quadrupole mass spectrometry. The concentration of capsaicin in the blood serum samples did not exceed the lower limit of quantification, the researchers reported in the journal BMC Veterinary Research. In two of the nine horses, the concentration of capsaicin was quantifiable in the serum 12 hours following the last gel administration, although at concentrations below the lower limit of quantification. Capsaicin was not detected in the serum beyond the 12 hours. Capsaicin was not detected in the blood plasma samples at all, and dihydrocapsaicin was not detected in any of the samples. None of the horses showed signs of discomfort, pain or stress associated with the effects of capsaicin, the authors said. Discussing their findings, the researchers said the obtained results suggest only a short-term detectability period for capsaicin even after its use over five days. The results of the study did not exceed the lower limit of quantification – in other words, the capsaicin was at very low concentrations. However, the results were contrary to those obtained in another study reported in the literature, in which it was found that the concentration of capsaicin 24 hours following its administration was higher than those obtained here, despite the use a similar method and the same detection technique. The non-detection of dihydrocapsaicin was also at odds with that study. “The obtained results may be caused by breed differences between the studies, the different hair and feathers length as well as differences in the gel ingredients (especially the medium),” they said. Due to the possibility of local irritation caused by capsaicin, the application area was not shaved despite differing hair length among the studied horses. In addition, a polar-fleece bandage was applied to the treated area according to the treatment regimen, potentially causing some of the gel to absorb into the bandage material rather than the skin. The study team said their results may be useful for horse owners and veterinary professionals to determine the period that should lapse from the administration of gels containing capsaicin (long-term therapeutic use) to the participation of the horses in riding events to ensure they don’t breach FEI anti-doping rules. “Based on these results, capsaicin cannot be detected in horse serum 24 hours after its administration using the therapeutic five-day regimen and a commercially available gel together with a polar bandage,” they concluded. The second aim of the study was to determine the best study material for the detection of capsaicin and dihydrocapsaicin. “According to the current study, serum is the best material for the detection of capsaicin,” they reported. They said the detection of capsaicin in horse hair has not been established so far, which should be the subject of further research. The researchers were from two Polish institutions, the Wroclaw University of Environmental and Life Sciences and Wroclaw Medical University.